Are you a Hebrew or a Jewish school educator? Are you looking for dynamic interactive lessons? Are you looking for fun ways to reinforce Hebrew and Jewish Holiday vocabulary, Torah stories or the weekly Parasha? Are you tired of asking the students: “Tell me 2 new things you’ve learned today”? If your answer is yes, this is the book for you. 101 Let’s Have Fun contains an abundance of activities for students, which is enriching, enjoyable and engaging. Your class will learn in a fun and active environment while your teaching will evolve into a satisfying and inspiring experience. In 101 Let’s Have Fun you will find 101 games and activities that will introduce new vocabulary in a unique way, teach or review the Hebrew alphabet, and reinforce the Hebrew and Jewish Holiday vocabulary in dynamic-interactive ways. But more important, this book will make your students feel more comfortable using Hebrew vocabulary, as if they always have. 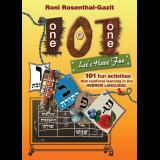 101 Let’s Have Fun also includes more than 30 ready to be used Hebrew worksheets. If you are a Jewish educator or a Hebrew school teacher this book is for you. "Getting a copy of this book was the best thing I ever did. Now, I don't have to spend hours on planning activities for my class" (Melisa Ark, 6th grade teacher). This is just a couple of reviews we've recently received from our best reviewers, teachers like you.